This blog is now the Sinn Féin candidate for Louth and East Meath. In the Fairways Hotel last night party activists from across the constituency unanimously and enthusiastically endorsed my candidacy. I thank them for that. Louth like all the border counties has suffered grievously as a result of partition. The Good Friday Agreement has provided a peaceful and democratic way to unite the Irish people. Sinn Féin is committed to this. It is about the nation – the whole nation – all 32 counties. It is about nation building. Change is possible. Look at the peace process, imperfect though it is. Much more needs to be done by the Dáil to transcend partition and to have a single island policy focus. Good inclusive relationships need to be continuously fostered with unionists. A rights-based society – a true republic - requires citizens to fulfil their obligations for the common good. It also requires the state to inform all citizens of their rights, and to uphold and defend these rights. These are just some thoughts, some ideas of the new type of politics – republican politics – that might shape the future. There will be three elections in 2011. On May 5th – the 30th anniversary of Bobby Sands death – the electorate in the north will vote in local government and Assembly elections. When the Taoiseach eventually calls an election we will vote for a new Dáil. It looks like being an interesting year. I'm a Swiss citizen and I have a blog in french about Northern Ireland. I have lived a few months in Northern Ireland last year. Then I had to return in Switzerland. I had a quite short political experience in Switzerland as well as president of local authority. It should be too long to explain you my reasons here but I'm a supporter of you, of Sinn Féin and of the republican cause. My projects in a very near future will be to become a member of Sinn Féin and support the "Ag Aontú Éireann" website and Sinn Féin with my blog. I would like to congratulate you for your blog and especially for your message of today 14 December. I was very touched by your words today for a united Ireland and I hope it will be a reality one day. It must be so! May your next elections be a large success for you and for Sinn Féin as part of the conquest of the Dáil Éireann! I hope to come back very soon next year in Northern Ireland. 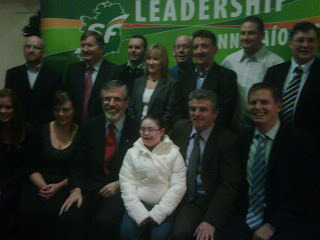 Gerry ,The enthusiastic Sinn Féin candidate for Louth and East Meath. What you have written make total sense. For the 26 counties is a Republic in name only, I far as I can see.